The small separate side stone house is located in the south of the natural park "Périgord-Limousin". It was completely renovated in 2016 and was rented for the first time in 2017 as a guest house. It is part of a former farmstead, which consists of a main building and the annex. Situated on the edge of a small village community on the top of a 4-hectare land and allowed a kilometer wide view over the region in the typical hilly landscape with forests and meadows. The living area offers 2 people a stylish setting with an outdoor terrace facing south and a covered summer kitchen with views of the surrounding orchard that also offers shaded areas in the summer. The lower, open living-kitchen area features a cozy sitting and dining area with a kitchen sofa and wood burning stove. The small kitchen offers all the necessary comforts ready. The bathroom with shower and toilet is located next to the kitchen. From the living area is reached by a small staircase to the overlying bedroom. Currently we do not live in France for professional reasons. During our presence, we offer our holiday guests, however, in addition to our hospitality, like also additional offers such. B. - breakfast and / or dinner, - professional shiatsu massages. If necessary, talk to us early enough when planning your vacation. Beautiful in a quiet location. The property is exactly as it is in the pictures. It is not that old so still new and fresh. Georg and Petra have put a lot of hard work into restoring and presenting a beautiful property. The location is on the top of a valley surrounded by a handful of properties and so quiet. It is just outside Saint-Pardoux la-Riviere which has a small Auchan which does your needs well and has a petrol station which is handy. Georg and Petra have a house next door and when we arrived there was a beer in the fridge and a bottle of wine as well so a great start to our stay. It has everything you need and we used the outside kitchen more than the inside due to the great weather. The view is great, lots of chairs and sun loungers to get on and relax. Georg and Petra are great owners, extremely helpful and we had a great time. We have been to the area before so know it reasonably well and so lots of castles , caves (Grottes des Villars definitely worth a visit), markets (Brantome - a favourite for us), canoeing and with great wine and food whats not to like. Sarlat-la-Caneda is a couple of hours away and is a great town to visit. We had a great time, book up and you will not be disappointed. 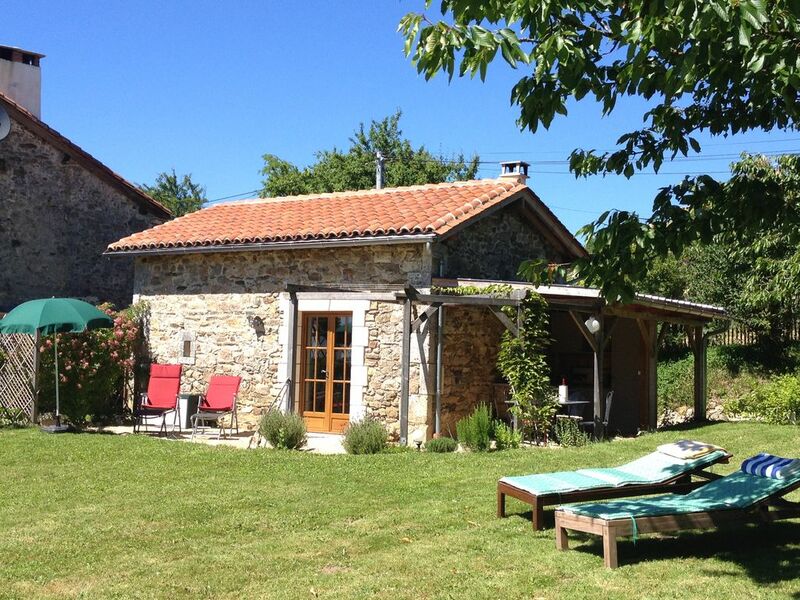 At a good distance from the Dordogne river, this is remote and secluded. The outdoor kitchen is great and in the garden there are shady places to sit. Indoors there is a smart ground floor bathroom and kitchen. The stairs to the bedroom are steep and only safe for the young and fit. Upstairs the pitched roof is too low for you to stand upright. There is a day bed where one person can sleep downstairs. I referred to the ceiling height of 1.60 m in my property description (equipment). Nous avons passé un très agréable séjour automnal dans ce petit gîte bien agencé pour 2 personnes. Nous y avons trouvé tout le confort nécessaire et la décoration est très cosy. Nous avons apprécié le calme de la campagne et la proximité des nombreux sites touristiques. Au plaisir de retourner dans ce gîte en période estivale. Klein maar gezellig en mooi huisje. Gezellig vakantiehuis waar we vriendelijk ontvangen zijn geweest door de eigenaren. Buiten grote tuin en een overkapping aan het huis met tuinmeubelen en buitenkeuken. Je kan in de omgeving ook verschillende uitstappen maken. Wij hebben hebben zeker een super vakantie gehad. Das Ferienhaus ist sehr schön eingerichtet, es ist alles da, was man braucht. Die Außenküche hat uns besonders gut gefallen. Das Haus liegt mitten in der Natur, fernab vom Touristentrubel. Für Leute, die Ruhe und Erholung suchen, genau richtig. Uns hat es sehr gut gefallen! Danke für Ihre Gastfreundschaft, Familie Mertens! The "La Maison au Verger" is located between the villages of Milhac-de-Nontron and Saint-Pardoux-la-Rivière on a hill. Geographically, one is here in the triangle of major cities Limoges, Angoulême and Périgueux - the latter the capital (all between 50 and 60 km). All these cities have airports, the university town of Limoges has an international station, Angoulême has a connection to the French TGV (2.5-hour drive from Paris). In the 4 km away town Saint-Pardoux-la-Rivière one finds the essentials: bakery and butcher, a small supermarket, a doctor, a post office, a cash machine and a recommended restaurant. The nearest large towns are Nontron (northeast 15 km) and Thiviers (southwest 20 km). Here there are all shops and supermarkets, rewarding weekly markets and banks. The touristic place Brantôme with old abbey is southwest 24 km away. Besides lounging, sunbathing and good food, there are opportunities for swimming in lakes, hiking, climbing, horse riding, cycling, canoeing and cave of Villars in the immediate vicinity. Small medieval towns and villages with colorful street markets, music and folklore festivals in the summer, fortified castles and the famous caves of Lascaux with cave paintings of early man are some worthwhile destinations. Mushroom pickers come during the late summer and autumn on their costs, for which the Dordogne is known. The capital Périgueux, with the largest dome church in Europe, combines her typical regional architecture with southern charm. The wine town of Bergerac and tourist attractive medieval little town like Sarlat-la-Caneda Domme or are (100 km) located further south. The Atlantic coast to the west is about 160 km (Royan, Gironde estuary or Ile d'Oléron), Bordeaux in the southwest is 170km away.